Exhibitors are a welcome presence at the annual CSP meeting. Attendees learn about and network with the broader statistical community while they speak with leading companies and meet with fellow statisticians. 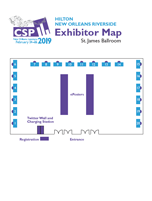 Check out the 2018 exhibitors who helped bring cutting-edge products and services to CSP. And don’t forget to check back for 2019 exhibitors this fall! Thursday 5:30 p.m. – 7:00 p.m.
Friday 7:30 a.m. – 6:30 p.m.